Plum City – (AbelDanger.blogspot.com): United States Marine Field McConnell has linkedSignal Systems’ remote-towers public key infrastructure developed by Jason McLean while he served as Special Assistant in the Office of the Prime Minister of Canada (2000-2002), to the pig-farm controlling mind (brain?) for Starnet’s online-gaming snuff-film services and the alleged spot-fixing of body counts for the recent train crash in Spain which points to the use of a portable repeater to trigger dial-a-yield explosive devices in the second car (see video). McConnell alleges McLean procured public key infrastructure from MacDonald, Dettwiler and Associates of Richmond B.C. to build a Signal Systems spot-fixing partnership with Starnet’s pig-farm brain in Carrall Street, Vancouver, and the late General Haig’s co-investors in the CAI Private Equity Group including Pierre Lortie, fired former president of the builder of the train in Spain – Bombardier Transportation! Dial a Yield with Signals Systems portable repeater? White smoke from aluminothermic reaction involving the oxidation of Aluminum (Al) powder by a metal oxide (MxOy): 2 Al(s) + MxOy(s) = Al2O3(s) + 3x M(s)? A witness told a Spanish radio station she first heard a loud explosion and then saw the train derail, according to Reuters. may be more than a fast train. 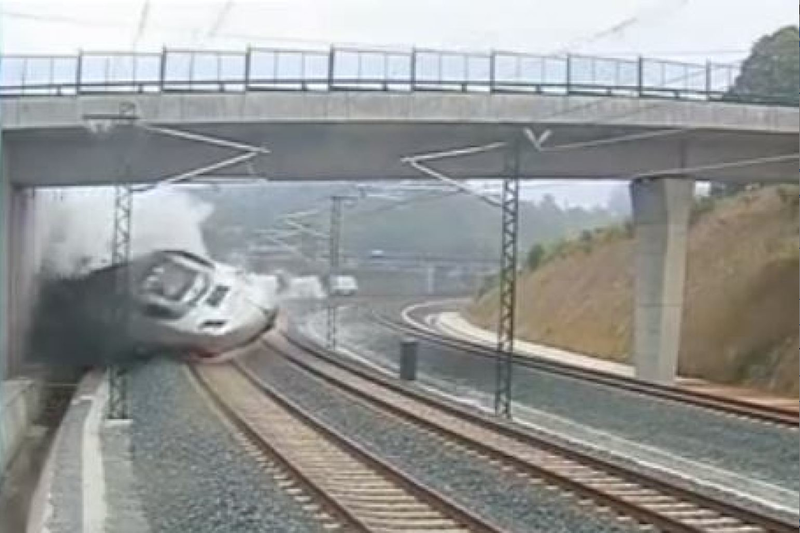 Police put the driver of a Spanish train under investigation on Thursday after at least 80 people died when the train hit a sharp bend at high speed, derailed and caught fire near the pilgrimage centre of Santiago de Compostela, in one of Europe’s worst rail disasters. Dramatic video footage from a security camera outside the northwestern city showed the train hurtling into a concrete wall at the side of the track as carriages jack-knifed and the engine overturned. The crash was caused by excessive speed, an official source with knowledge of the accident investigation told Reuters. However, results of multiple investigations into possible failings by either the driver or the train’s built-in speed regulation systems are not yet in. One local official described the aftermath of the crash, on the eve of one of Europe’s biggest Christian festivals in the ancient city, as like a scene from hell, with bodies strewn next to the tracks. An Associated Press estimate of the train’s speed at the moment of impact, using the frame rate of the video and the estimated distance between two pylons gives a speed range of 144-192 km/h. Another estimate calculated on the basis of the typical distance between railroad ties gives a range of 156-182 km/h. Officials say the speed limit on that section of track is 80 km/h. The figures supported the assessment of experts that the train appeared in the video to be moving well above the speed limit when it crashed Wednesday. A spokesperson for Galicia’s Supreme Court told Reuters that one of the train’s drivers, who was hospitalized with unspecified injuries, was being questioned by police as a possible suspect. Another investigation into possible faults in safety equipment is also underway. It was not immediately clear which of the train’s two drivers was under investigation. But Renfe, the state-owned company operating the train, identified him Thursday as Francisco Jose Garzon Amo, a 30-year employee of the state rail company. He was described as being a fully qualified driver. The company said 52-year-old Amo took control of the train from a second driver about 100 kilometres south of Santiago de Compostela. Renfe’s president, Julio Gomez-Pomar Rodriguez, told Spain’s Cadena Cope radio network that the driver had worked on that route for more than one year. MONTREAL — Bombardier Inc.’s chief executive Paul Tellier revealed a host of problems at the industrial giant’s rail equipment division in Europe as he promised yesterday to “take the hard decisions” to cut costs and boost the Montreal company’s weak stock price. In a conference call to discuss third-quarter profits slightly better than a year ago, Tellier said he would close plants at Bombardier Transportation, which has most of its operations in Europe. 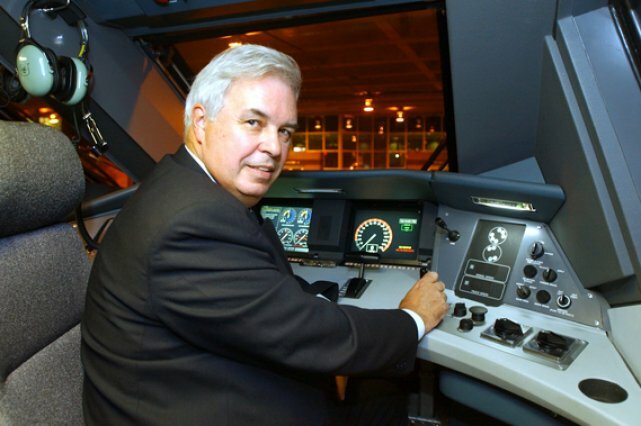 Tellier has cut thousands of jobs in Bombardier Inc.’s other major unit — the aircraft manufacturing division — since he took over the company nearly a year ago. Downsizing in Europe has been discussed before but clearly it wasn’t happening fast enough for Tellier, who just last week fired Pierre Lortie as president of Bombardier Transportation, the troubled rail unit. “Now that . . . competent management is in place we have to take the hard decisions,” Tellier said. Lortie has not been replaced, but Tellier named himself chairperson of the Bombardier Transportation management committee. Among other problems under the management of Lortie, Tellier said some of the 39 production plants in Europe are operating as low as 35 to 40 per cent of their capacity. He also said the company submitted bids to win new contracts too low to make an acceptable profit, and the costs of materials and subcontracting work were too high. Although orders keep flowing in, profit margins have been dropping, he said. “VANCOUVER, B.C.–(BUSINESS WIRE)–June 29, 1995–MACDONALD, DETTWILER (TSE,VSE:MDA) MacDonald, Dettwiler and Associates, Ltd. announced that its data communications unit, The PSC Group, has reached an agreement with Northern Telecom Ltd. of Mississauga, Ont. Under the pact, PSC is providing certain services for a new Nortel security product called Entrust [Public Key Infrastructure]. The PSC-Northern Telecom relationship is part of a new trend, called functional outsourcing, that is helping PSC to achieve rapid growth. Outsourcing allows independent consulting firms like PSC to provide training and other support for the customers of large multinational computer and communications companies. Over the past two years, PSC has developed its first outsourcing relationship, with computer network equipment manufacturer Cisco Systems Inc. [Signal Systems partner] of San Jose, Calif. Under this relationship agreement, PSC has become a leading trainer for customers of Cisco around the world. Cisco itself is growing quickly. Its sales nearly doubled in 1994 to $1.2 billion (U.S.) and customer demand for training is very strong. With a staff of about 120, PSC specializes in consulting and training related mainly to computer networking [Allegedly set up the Starnet pig farm brain at 425 Carrall Street in 1995]. PSC helps customers design and implement networks so that computers can communicate faster and at less cost. PSC’s training is conducted from offices in Toronto, Washington D.C., London and Sydney, Australia. In addition, PSC sends instructors and portable laboratories from city to city to provide courses at locations convenient to customers. PSC has the capacity to teach in English, French, Spanish, Russian and several other languages [Ergo is training agents in the use of Signal Systems’ remote towers for MitM attacks].